Accounting students will soon be putting their skills to work helping their peers and community members file tax returns as part of the Volunteer Income Tax Assistance (VITA) program. There will be five different sessions of the VITA program. They are scheduled from 8 a.m.-3 p.m. in Violette Hall 1424 on Feb. 9, Feb. 16, Feb. 23, March 2 and March 23. Signs will direct clients to the location. Taxpayers should be sure to bring proof of identity; copies of all W-2, 1098, 1099 forms and any other tax forms received in the mail; social security cards for all individuals listed on the tax return; and banking information if a direct deposit is desired. All participating accounting students have received special training and at least one accounting faculty member will be present to review tax returns and answer any questions. Clients will be accepted on a first-come, first-serve basis. The program does reserve the right reject complex returns. The VITA program is sponsored by Beta Alpha Psi. For more information, call 660.785.4378. Abstracts for Truman’s 26th annual Student Research Conference are due by Feb. 22. The conference is a University-wide celebration of student research, scholarship and creative achievements. Both undergraduate and graduate students are invited to submit abstracts. Abstracts should be submitted online at src.truman.edu. All abstracts need to be sponsored by a Truman faculty or staff member. A copy of the information submitted will be sent electronically to the student presenter’s mentor for approval. Students should work with the faculty mentor before submitting the abstract to minimize multiple drafts in the system. The submission site is now open and the deadline for receiving abstracts is 11:59 p.m. Feb. 22. The Student Research Conference is scheduled for April 16. In addition to the many student presentations, the day will feature a conference-wide plenary address delivered by Bruno Louchouarn, director of the Keck Language and Culture Studio at Occidental College. Louchouarn is a composer and cognitive musicologist. He teaches courses in music for film, television and other media, as well as cognitive science. Faculty-requested special sessions are included in the discipline options. Inquiries about the Student Research Conference sessions, guidelines and program can be emailed to osr@truman.edu. Questions or problems with the abstract submission process can be directed to Marsha Redmon at 660.785.4598. For the past two years, a number of Truman students have been donating their time in the Kirksville community to inspire a love of learning in children ages 4-14 through the Peace program. Peace is a non-profit after-school program that involves volunteers going to the Devlin Place housing complex located several blocks to the southwest of campus to mentor neighborhood children. While about 20 children attend regular sessions, which take place from 3:30-5:30 p.m. Mondays through Thursdays, the program saw more than 100 different children over the course of the last year. Kirksville’s Peace program was established in 2010 and modeled after a similar program in Columbia, Mo. According to Amy Burbee, a Peace program coordinator, the decision was made to introduce the program in the Devlin Place area after a group of students spent a summer volunteering and distributing lunches through the Food4Kids program in a nearby park. After building a relationship with the families in the area, these students saw a need for the program. Peace volunteers provide children with homework help, healthy snacks and fun activities. Peace is unlike many other after-school programs in that it is provided at no cost to the children or their parents, and the volunteers go to the students’ neighborhood for all activities. In addition to the after-school program, Peace has also conducted other programs in the community. In December, Peace volunteers put on a Christmas tree giveaway, and in the summer they distribute free lunches. Throughout the year, Peace accepts donations and gives clothing to those in need. Peace is staffed completely by volunteers, mainly Truman students and members of the Life Church High School. Peace is affiliated with the University through the campus organization Equipped, but participating Truman students do not receive course credit or scholarship hours, they simply do it for the experience. Peace is supported entirely by donations. Last fall, Truman students sold kettle corn to help raise funds. All financial donations go toward food, supplies and other basic necessities for the program. More information about the Peace program is available online at peacekv.org. The site includes ways to make donations and also has steps for anyone wanting to volunteer as a tutor. 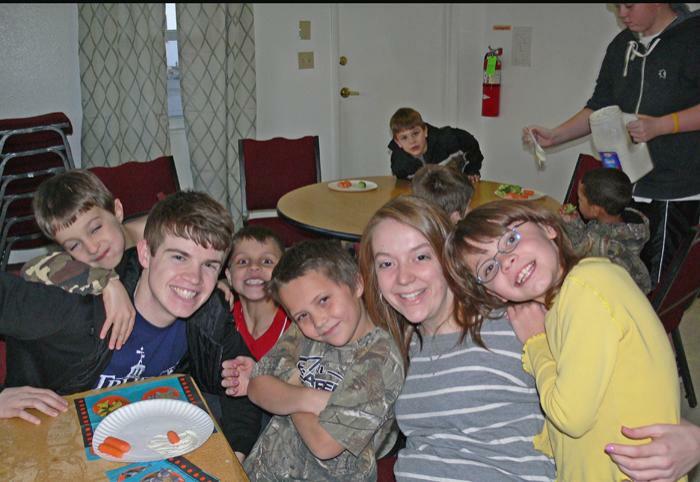 Truman students Amy Burbee (second from right) and Andrew Fajkus (second from left) with children in the Peace after school program. Members of the Truman chapter of the International Reading Association wrap books before the winter break. IRA hosted a book drive to benefit children in foster care in Adair County. With the help of many departments on campus, the group collected more than 300 books meaning every child in foster care in Adair County received a new book for the holidays. IRA, which is primarily made up of Master of Arts in Education students, is dedicated to promoting literacy in children and young adults. 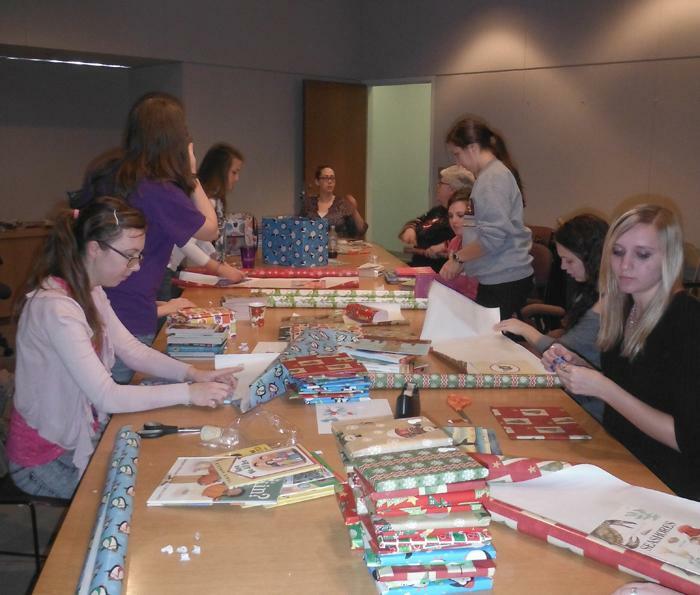 Members from the National Education Association and Kappa Delta Pi helped wrap the donated books. An exhibit honoring the service of Alphonso Jackson, a Truman alumnus, is currently on display in the Library gallery. Jackson served with the Bush Administration from 2004-2008 as Secretary of Housing and Urban Development. He donated a collection of items acquired during his years in HUD to the University. This exhibit will be available for public viewing until Feb. 22. Antonio Scuderi, professor of Italian, published “The Gospel According to Dario Fo” in the journal New Theatre Quarterly in Great Britain. The Women’s and Gender Studies Conference will take place from 9 a.m.-6 p.m. Jan. 31-Feb. 2 in the Student Union Building Activities Room. For more details, visit wgstconference.truman.edu. Dr. Brian Hsu, winner of the Concerto Competitions at Juilliard and the University of Michigan, will present a Visiting Artist Piano Recital beginning at 2 p.m. Feb. 3 in Ophelia Parrish Performance Hall. Following the conclusion of his program, Hsu will conduct a master class from 3:30-4:30 p.m. in Ophelia Parrish Performance Hall that features two Truman piano majors. The public is invited to attend both events, free of charge.